Toyota Material Handling Northern California (TMHNC) is the Material Handling industry leader for forklift sales, service, parts and more. 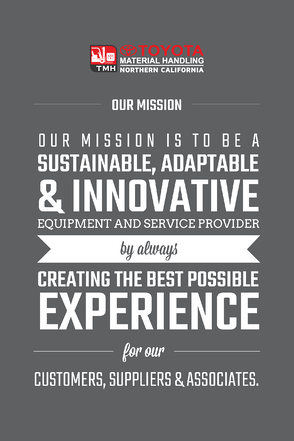 At TMHNC, we provide an environment that is challenging, collaborative and rewarding for our employees. It is through the dedication and team work of our employees that allows us to achieve success. Our core values are communication, transparency, accountability, training & development and follow-through. To learn a little more about what it's like to work at TMH, check out our employee spotlight posts. We offer a career, not just a job. We understand how important benefits are, not only to employees and their families, but to our community as well. TMHNC offers affordable comprehensive medical, dental, vision, 401K plan, life, AD&D and LTD insurance, and a generous amount of vacation, sick, and holiday pay. Toyota Material Handling Northern California (TMHNC) is an Equal Opportunity Employer and Affirmative Action Employer. We are strongly committed to this policy and believe in the concept and spirit of the law and will not discriminate against any applicant or employee because of a mental or physical disability, special disabled veteran status or eligible veteran status regarding any position for which the applicant or employee is qualified. TMHNC will make every effort to provide reasonable accommodations to any physical and mental limitations of individuals with disabilities and to disabled veterans. TMHNC is committed to a policy of taking affirmative action to employ and advance in employment all qualified individuals with disabilities and covered veterans at all levels of employment. Such actions shall apply to all employment practices, including, but not limited to the following: hiring, upgrading, demotion or transfer, recruitment, advertising, layoff or termination, rates of pay or other forms of compensation, benefits, selection for training (including apprenticeship), tuition assistance, and social and recreational programs. Need to get your forklift certification?